The Special Inspector General for Afghan Reconstruction released a mixed report to Congress today, highlighting gains in security in some regions while pointing out lagging, expensive development projects. The Afghan government’s authority in Helmand remained relatively stable this quarter, according to State. With solid connections established between the provincial capital and district centers in central and southern Helmand, local officials are able to operate effectively. In these areas, Afghan government officials are able to provide government services with little or no support from the Provincial Reconstruction Team (PRT) and District Support Teams (DSTs). Moreover, local administrators are becoming more technically capable. Overall, the government’s influence in the province is expanding, but Kabul’s ministries need to improve their performance to sustain and expand influence. For example, State said an increasingly unreliable IDLG and irregular funding levels have undermined local governance. State also reported this quarter that Helmand’s new provincial governor and local civil servants can travel regularly to the southern and central districts. Kajaki and Now Zad still present security challenges, but local officials are increasingly able to travel to these areas by road. The district centers in northern Helmand are under Afghan control, but efforts to expand control outside of those areas have largely been unsuccessful. The Taliban shadow government controls no areas in Helmand, although they do still have a presence and conduct operations to maintain and build their influence. That jives pretty well with commonly held assumptions that U.S. and Afghan forces have been able to keep a handle on the centers of districts like Sangin and Marjah, while patrolling less frequently in the countryside. 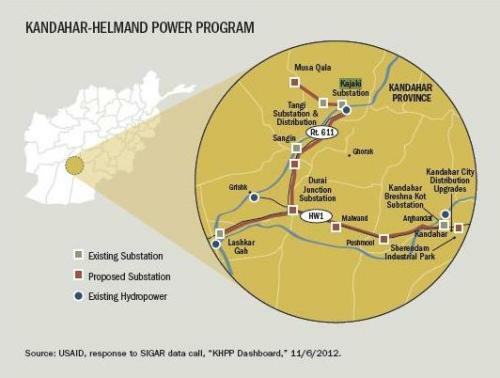 The Kandahar-Helmand Power Project (KHPP), shown in Figure 3.33, aims to simultaneously increase the power supply in Kandahar and make it more accessible to the population. USAID awarded a $266 million contract to Black and Veatch to design and build new diesel-powered generators, rehabilitate power substations, upgrade the electrical distribution system, and install a third turbine at the Kajaki Dam. This project, considered an important element of the counterinsurgency strategy in southernAfghanistan, is intended to improve the quality of life for the people of Kandahar. As of December 31, 2012, USAID had obligated $139.5 million of ESF funds for the KHPP.419 U.S. Forces–Afghanistan, U.S. Army Corps of Engineers (USACE), and USAID are working closely on related components of the project. However, the project has encountered a number of challenges. Security issues have caused the timeline for completion of the project to extend to mid-2015. 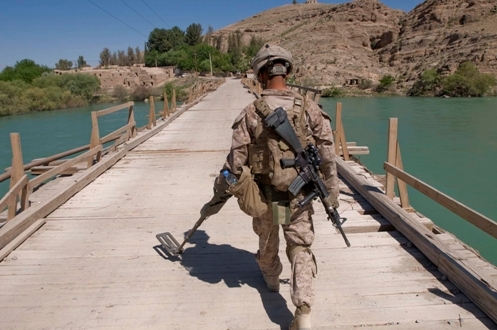 During this reporting period, USACE scrapped plans to establish a project integration office at Kajaki and terminated its security contract for the Kajaki site. Afghan Public Protection Force guards forced an eight-daywork stoppage, adding $200,000 in costs. In a separate issue, the lack of U.S.-flag carriers, whose use is legally required for transporting a percentage of USAID-financed commodities, has delayed the ocean shipment of transformers and circuit breakers from Mumbai to Karachi. As mentioned previously, we continue to follow projects like this on Battle Rattle because Marines have fought and died to create the space to make them possible. Their longterm viability still appears to be in doubt.